Erasmus Mundus Scholarships for International Students. DAAD is an academic exchange service that has collaboration German and other international institutions. The service is inaugurated in order to exchange the talented scholars for improving the learning. The service provides masters level grants to Pakistani and other international students to go and study in world’s best institution. The date of form submission to DAAD grant is JUL to AUG of every year. The grant holder is exempted from the tuition fee of the institution. The service provides course-specific grants to the scholar of policy making good governance and development-related subjects. KAAD grants are offered for post graduate studies to the candidates of under development regions and countries. Host institution for this financial assistance are all universities of Germany and higher education institutes. The grants cover all educational expenses of the holders and time duration of granting this assistance is for the whole time period of the study program. This economic assistance is given to all global scholars of developing countries without any ordering of subjects. Deadline for applying for this grant are 30 JUN and 15 JAN annually. Max Plank institution of Germany invites 50 global scholars to come and study there. Grant is available for doctoral programs in the field of a solar system for the academic program of 2018-2019. The financial assistance will be provided to 50 scholars from all over the world. The amount of the grant will cover the tuition fee and other expense of the holder. The financial assistance will be provided for three years. To get any of these grants or Financial Aids, initially, candidates are required to get enroll in any of the hosting institutions for respective field of the study program. After that, they are required to apply for the grant through a respective channel or through their institution. I wanna apply for MBBS in Germany …. what I have to do? We have updated all scholarships updated later. how to apply in germany for mbbs and what qualification and marks are required? I wanna apply for mbbs in Germany plz tell me how can I apply????? i want to do mbbs from germany and i have 83.27% marks in F.Sc medical. Is there extra scholarship for me?? And ielts and german language is necessary or not? I am doing BS software engineering currently in 4 semister and next 4 semister i want to study in germany. Please guide me. 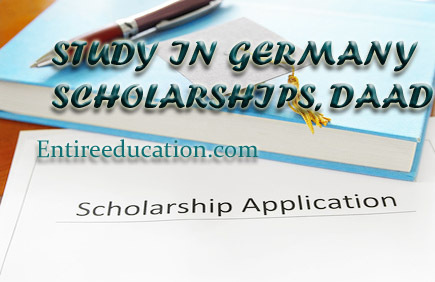 Germany offered the various scholarship for students. But you apply for admission after BS Degree through HEC. HEC offered a scholarship for students in the month of Sep/Octo. You apply online through HEC official website for commonwealth scholarship. I am doing bachelor with Aviation management, in six semester which is almost at end with 3.6 GPA. I want to do Master in Aviation from Germany so i need help. Kindly leave your suggestions.